Did Game Camera Snap Extraterrestrial Photos? 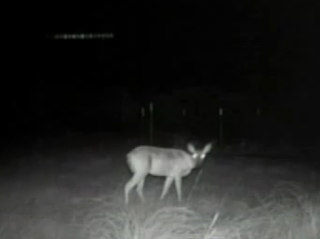 August 25, 2010 – A motion-activated camera at a Fort Worth family’s favorite hunting spot is capturing shots of mysterious objects. Lisa Brock-Piekarski’s game camera is supposed to take pictures of the deer on her Archer City lease. But the pictures show something she can’t explain. Brock-Piekarski’s is hesitant to call the string of lights in the sky UFOs, although she can’t identify the flying objects. This looks just like the Hudson Valley craft. . . hmmmmmmmm. . . . . . .